by Bozarth, Cecil B.; Handfield, Robert B. 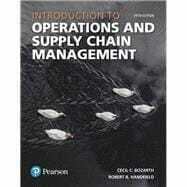 For courses in operations and supply chain management. Introduction to Operations and Supply Chain Management is an integrated, comprehensive introduction to both operations and supply chain management (SCM). The text remains engaging and brief while integrating all of the major concepts of both subjects in one cohesive source. The 5th Edition contains updated content and thorough coverage of analytical tools and techniques that students will apply to their careers in operations and SCM. It explores these topics in an interesting and relatable manner, providing students with real-world examples and easy-to-understand material. By combining trusted authors’ content with digital tools and a flexible platform, MyLab personalizes the learning experience and improves results for each student. Note: You are purchasing a standalone product; MyLab Operations Management does not come packaged with this content. Students, if interested in purchasing this title with MyLab, ask your instructor to confirm the correct package ISBN and Course ID. Instructors, contact your Pearson representative for more information. Cecil Bozarth is Professor of Operations and Supply Chain Management at the Poole College of Management at North Carolina State University, where he has received awards for teaching excellence at both the undergraduate and graduate levels. He is a former chair of the Operations Management Division of the Academy of Management, and in 1999 was recognized by APICS as a subject matter expert (SME) in the area of supply chain management. His particular areas of interest are operations and supply chain strategy and supply chain information systems. Bozarth’s consulting experience cuts across a wide range of industries, including such companies as BlueCross BlueShield of North Carolina, Daimler-Benz, John Deere, Duke Energy, Eisai, Ford Motor Company, GKN, IBM, GlaxoSmithKline, Milliken, Patheon, Sonoco, and others. For 13 years, Bozarth was an associate editor for the Journal of Operations Management; he now serves on the journal’s editorial advisory board. Bozarth has also served as a guest editor for the Academy of Management Journal, as well as the Journal of Operations Management. Robert Handfield is the Bank of America Professor and a Distinguished University Professor at North Carolina State University. Handfield has consulted with over 25 Fortune 500 companies, including Biogen Idec, Caterpillar, John Deere, GlaxoSmithKline, Boston Scientific, Delphi, Chevron, British Petroleum, Chevron Phillips, Bank of America, Sensata, Honda of America, KPMG, ConocoPhillips, Federal Express, SAP, and others, and is a world-renowned expert in the areas of purchasing and logistics. Handfield is the former editor-in-chief of the Journal of Operations Management and has written several books on SCM topics, including Introduction to Supply Chain Management (Prentice Hall, with Ernest L. Nichols; translated into Japanese, Korean, Chinese, and Indonesian), Supply Chain Redesign (Prentice Hall Financial Times), and Purchasing and Supply Chain Management, 5th edition (South-Western College Publishing, with Robert M. Monczka, Larry C. Giunipero, and James L. Patterson).